Woolymama began as an expression love. A love for wool and for creating! I am a wife, a mom, a farmer and fiber artist. I raise a small flock of wool sheep in the Upper Peninsula (U.P.) of Michigan on our sustainable family farm, Shady Grove Farm U.P. At Shady Grove Farm we proudly use sustainable practices on our Certified Naturally Grown permaculture operation, to ensure what's best for the animals, the people, the Earth, and the system as a whole. 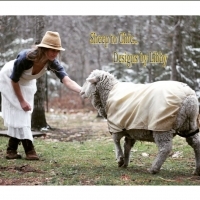 After being a long time knitter and spinner, in 2008, I began designing and creating one of a kind felted garments and accessories, using wool from our sheep, and eventually supplementing with some Merino wool from sustainable sources. My friends and family loved the functionality of the pure wool products and so Woolymama was born. Since that time, I have designed and created hundreds of garments and accessories--everything from mittens, wrist warmers, skirts and dresses, all the way up to custom brides maid and wedding dresses! My customers love the feel and functionality of the fibers and fabrics I use to create this wearable art! Many pieces are 100% wool, while others are combinations of wool and silk, or wool and cotton. I guarantee the integrity of the products from source to final product. You will love your garments as much as I love making them. It is an honor to create something for you or your loved ones. I look forward to working with you to create the "perfect" piece of art for your taste and style! Every piece of wearable art in this store is a unique, one of a kind item! I can NOT replicate any of them exactly, as the wool takes on a shape of its own during the felting process. Colors will also display slight variations from piece to piece. I can work with you to create the custom piece and colors you are looking for, and will do my best to ensure it meets your satisfaction! $5 for hats/mittens. Boots to be determined at sale. These writ warmers are as beautiful as they are warm. It was exactly what I wanted and Libby worked closely with me to make sure it was everything I needed and wanted. I am a very happy customer and will return many times!